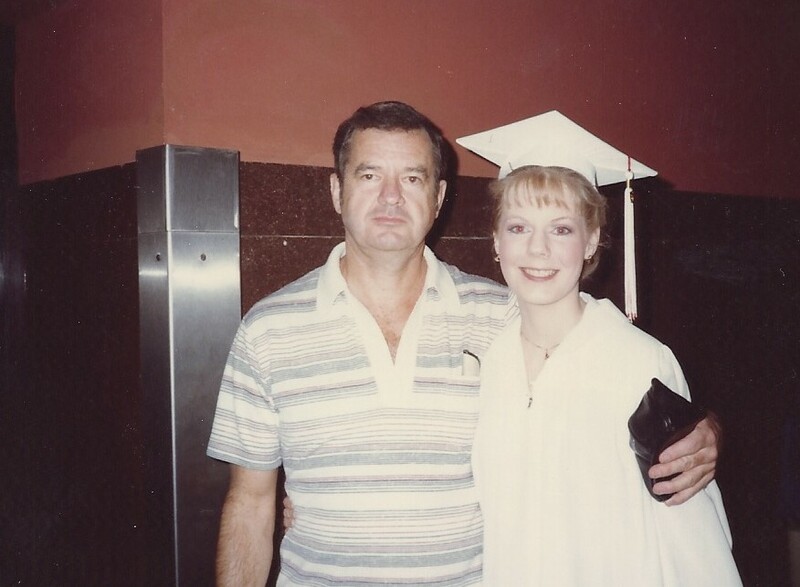 Me and Dad at my high school graduation. Today would have been Dad’s 84th birthday. He’s been gone 18 years, and I still miss him every day. It’s difficult to sum Dad up in a few hundred words. He was smart, kind, stubborn, ornery and funny. Very, very funny. He loved learning and was always studying something; the Civil War, philosophy, religion and politics were among his favorite topics. He also laughed until he cried watching the Three Stooges and Peter Sellers movies. Dad always had an opinion, and we always knew what it was. Anyone within hearing distance knew as well. 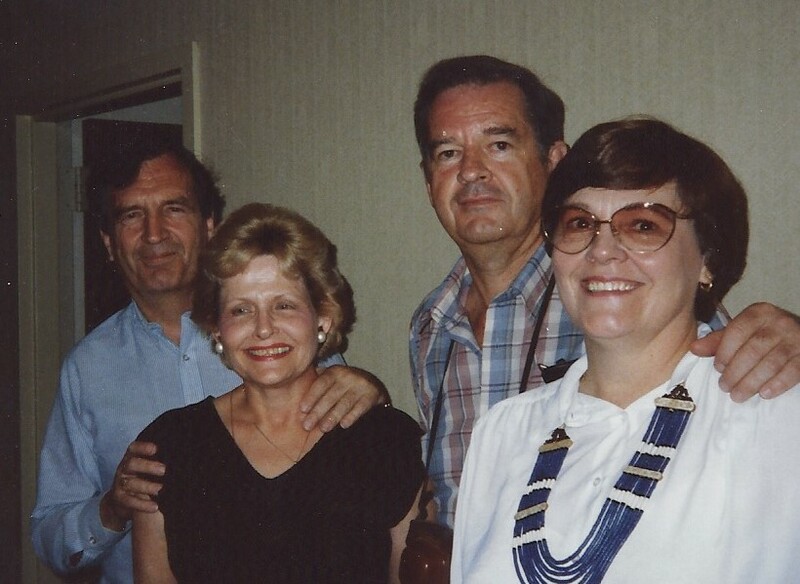 Uncle Tommy, Aunt Barbara, Dad and Mom at the OU-Texas game in 1985. Boomer Sooner! He loved life and greeted each day by stepping out onto the front porch in his boxers and shouting, “hello, world.” Hello, indeed. Dad was always reading — usually five or six things at a time. He kept pencils and a small ruler nearby so that he could underline favorite passages and make notes in the margins. We all borrowed his books, and it was sometimes a puzzle to understand why he underlined what he did. Whenever he came upon something really interesting, he would make photocopies with notes and mail it to us. He also read the dictionary regularly and shared his immense vocabulary with us. I’m not certain, but I’m guessing most kids didn’t grow up performing matutinal ablutions, being frustrated over a Hobson’s choice and enjoying his quotidian jocundity. (Get the dictionary; I’m not going to do the work for you.) If you use a new word three times, it’s yours to keep. Dad did not have it easy growing up and was determined to provide us with a different kind of life. He put himself through undergraduate and law school at the University of Oklahoma with a year at Yale thrown in for good measure. He was in the Air Force and went to Korea. He had a private practice in Purcell, Oklahoma, where we were all born, and then spent 10 years as a state representative. 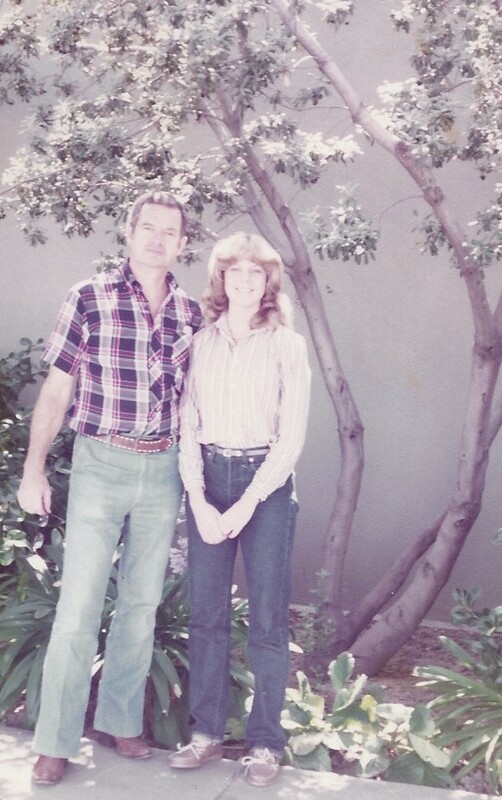 Me and Dad in California in the early 1980s. In 1973, we moved to Kansas City when Dad took a job as legal counsel for Montgomery Ward. His career took them (and me, mostly) on to Dallas, Chicago and San Francisco before they returned to Kansas City in 1986 to be near their kids and grandkids. His family was his passion and, even though I did not fully appreciate it until I was an adult, he loved us all fiercely. Remember that stubborn trait I mentioned above? I may have inherited that tendency and there may have been a few arguments during my childhood and teen years. And by that I mean that I’m lucky to be alive, really. Mom is doubly responsible for my life. She gave birth to me and she kept Dad from killing me while I slept. Thanks, Mom. Dad mellowed over the years, as I think we all do, and relished spending time with his grandkids. He chased them around the yard with the garden hose, played Candyland and Pretty Pretty Princess as long as they wanted, and made them all laugh with his silly songs and jokes. I’m thankful that he was around long enough to get to know my kids a little, but wish we’d all had more time with him. Silly old Papa. See you ‘round if you don’t turn square. Don’t wear a hole in your underwear. Thanks for reading. Stay tuned for more Tales from the Empty Nest. Ha! I think I remember the postcard…the poor young woman on the beach who couldn’t afford the top to her bikini?